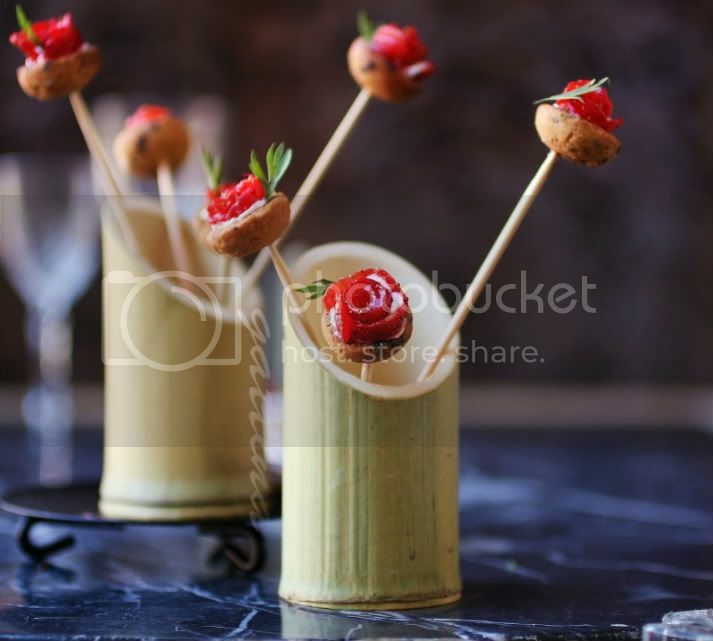 This bamboo tube is very sturdy and can hold up quite many sticks, and the bamboo also give a natural look to the presentation. ... ... I've ever made. I had been one party that the hotel's chefs made the desserts very very small. I guess since the desserts were served throughout the whole party time (love it! 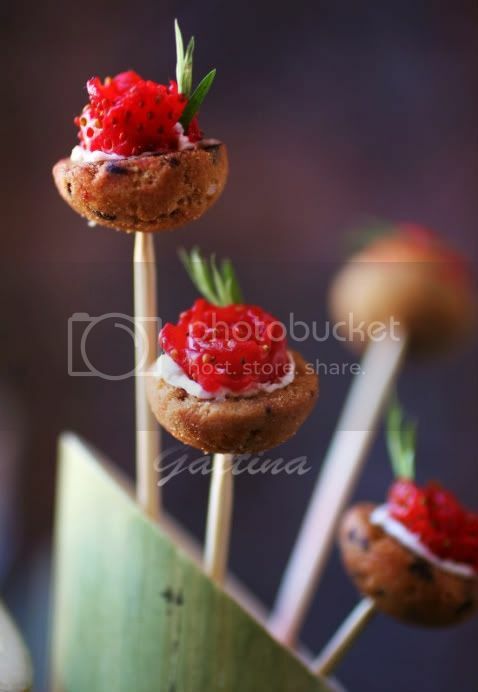 ), they were considered as gourmet hors d'oeuvres as well, thus the tiny portion couldn't stuff us up too soon. Tiramisu, mousse or cheesecake was able to fit into a doll's cup; they all were so adorable that I almost couldn't bear to eat them.... almost! mini cookies, like Chips Ahoy! First, freeze the mini cookies for a few hours. Use a very sharp knife (with a fine tip) to dig out a small hole from the cookies' bottom. Pipe the cream into the hole, top with diced strawberry, garnish with fresh herb. Gentle poke a stick to the top (now is bottom) of the cookie. Place quite a few of sticks into a tube and make it like a bouquet. Whipped cream may lose the stability in a hour. If you want to make the shortcake a few hours ahead, you can replace with cream cheese, and glaze the fruit with diluted apricot jam. Keep in fridge, uncover, until you serve. i'm sure all your friends will be very impressed with these shortcakes! i really like your creativity! these are so adorable! very creative! So cute, such a great blog! First time at your place. LOved it. Impressed by your clicks. I'm not getting any way to follow you. Please tell me how can I follow you. Vatsala, thanks for your sweet comment and visit :) unfortunately I don't know how neither... maybe other blogspot users can help (?) thanks in advance. OMG that's so cute! Great presentation. you've got lovely blog! those photos and and wonderfull and so creative! hi, just coming back to chk your posts..still on holiday? take care. Aw, do you know how I love your presentation of these shortcakes? Beautiful. This is both ingenious and adorable! Love it! wow! this not only looks but tastes fantastic! They are the smallest you have ever made and they are the most beautiful I have ever seen! 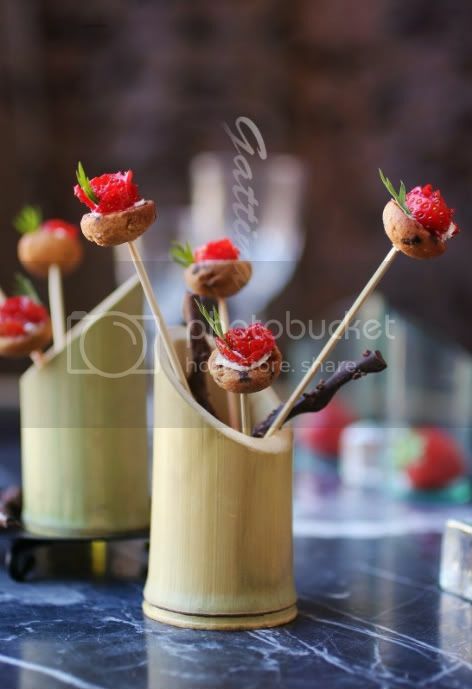 Those are precious, Gattina - what a wonderful idea for a dinner party!